I'm a big fan of the Ubiquiti UniFi networking gear, I wrote about how I was able to use their gear to provide micro-segmentation of my IoT devices from the rest of my network. However, one area that Ubiquiti really falls down on is internal DNS resolution of DHCP hosts. This is a problem they've had with their UniFi Security Gateway (USG) for quite some time, as documented here. Basically, however your device identifies itself to the DHCP server on the USG is how it will be inserted into DNS. If there's a space, then there's a space (and resolution will fail). There is no where to configure a default domain name (search domain) and if you use a Fully Qualified Domain Name (FQDN), resolution will fail. If you have to manually assign an IP address, it will not register in DHCP, so resolution will fail. Finally, even if you specify an alias via the USG configuration, that alias will be ignored in favor of the way the host identified itself to the DHCP server initially (no matter how broken, like having spaces), and resolution will fail. I eventually gave up on Ubiquiti ever properly fixing this issue. I, and others, reported it in November, Ubiquiti claimed, multiple times, to be fixing it and never did. So, I've decided to configure my Synology NAS to perform forward and reverse DNS for my internal network. I have several servers on my network, so constantly accessing them by IP address is just too much of an inconvenience. There is pretty good documentation from Synology on configuring your NAS for DNS, but I ran into several issues for proper configuration, so I decided to write this post to document how I was successful. First step is to install the DNS Server package from Synology by going to the Package Manager and then selecting the Utilities category. Once there, you should be able to find the DNS Server package and click Install. Now that you have the DNS Server installed and running, it's time to configure it properly. Configuring the DNS Server is performed by accessing the Main Menu and then running DNS Server. Now that your DNS Server is up and running, it is time to configure a Master Zone for your internal network. A Master Zone specifies that this server is authoritative for all of the Zone Records contained within it. A Secondary (Slave) Zone specifies that this server is authoritative, but is receiving the records from a remote server (the Master). A Forwarding Zone is one in which all queries are sent to a remote DNS server for resolution. The Forward Zone is what translates the names you type (e.g. robpickering.com) into an Internet Protocol Address (IP Address) (e.g. 192.168.100.10). I personally check Limit zone transfer and then leave it blank, which is effectively preventing any Zone Transfers from your server (which is as it should be). I also Limit source IP service, but for this one you'll have to go into the Source IP List and configure hosts or subnets that are allowed to query this zone. If you forget to do that and have this checked, your server will not respond. Clicking OK will save the zone. Now you can create some resource records! Set the Host/Domain to ns. [DOMAIN], where [DOMAIN] is your domain name for the zone (should match the domain portion in the Name area). This should now allow the domain to load properly. (*)Note: The Domain name for a Reverse Zone is actually the IP address subnet for which you want to provide records. In this example my internal network is 192.168.100.0/24, so my Reverse Zone is 100.168.192.in-addr.arpa. This is also for IPv4 subnets, if you wanted to provide Reverse lookups for an IPv6 subnet, you'd need to change the dropdown from .in-addr.arpa to .ip6.arpa. Run System Preferences from the  menu. 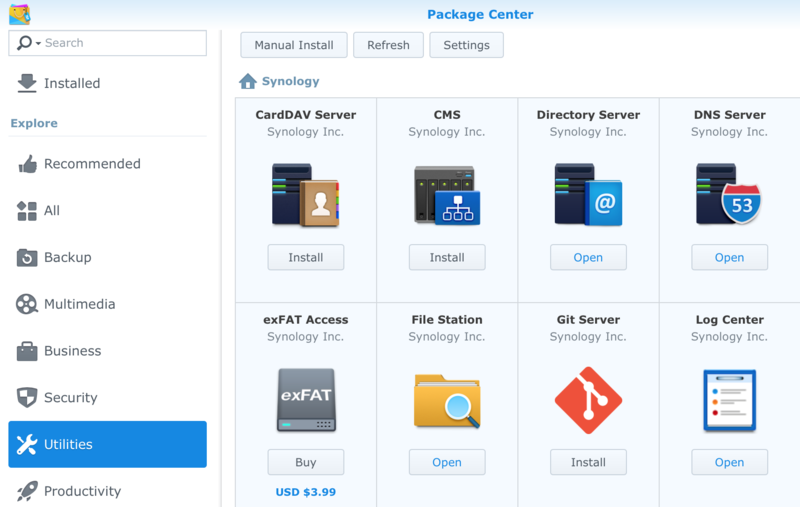 Now you should be able to access your Synology using the new internal name. You should have a valid DNS answer in your ANSWER SECTION, if you don't see the IP address portion then you may have an issue with your Zone file and you should take a look at the logs on the DNS Server application to resolve. 20.100.168.192.in-addr.arpa. 86400 IN      PTR     synology.example.com. You've now successfully configured DNS for forward and reverse lookups on your Synology. The only step left is to ensure that the IP address of your Synology is being configured on your internal hosts, which you'll do on your DHCP server.